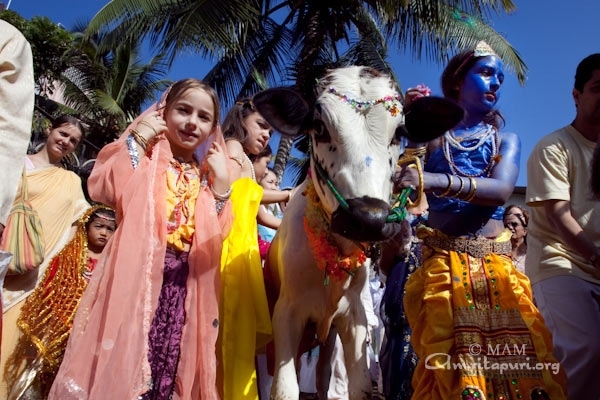 Sri Krishna Jayanthi day will be a full day of festivities, beginning with the GoPuja, or worshiping of the cows. Though now a sprawling ashram complex, almost like a small city, Amritapuri had about as humble a beginning as one could imagine – as a cowshed! The Kalari, the original ashram temple, was where Amma’s family used to house their cows, before Amma began to hold Devi and Krishna Bhava there. Always a favourite among devotees, the GoPuja reminds us of the important role the cow, symbolic of the mother, plays in our lives. It’s an opportunity for us to show our appreciation and reverence for her. 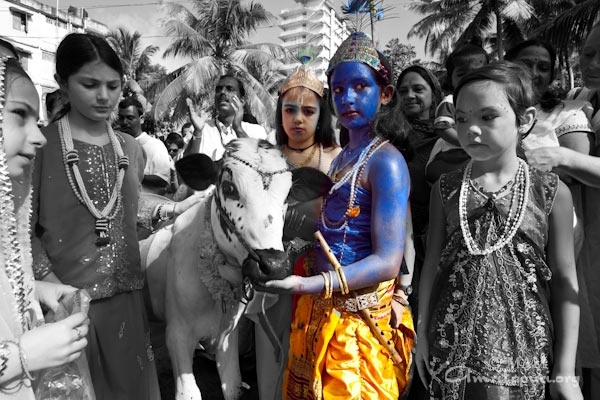 While possessing a beautiful spiritual symbolism and deep universal significance, cow worshiping might seem like a strange notion for those not raised in the Indian culture. But, as with most things spiritual, one must sincerely attempt to peel back the protective skin if one wants to get to the sweet fruit inside. Here is a creature that takes so little from nature – just some quiet grazing in the fields – and is abundantly generous in return. It takes those which we dont want, and gives the most precious things. It is easy to conceive of worshiping the cow if one can first understand love. If love is there, we are naturally inspired to serve. This service itself is worship! As Amma has said, when we truly love, each action spontaneously becomes a worship. This day, Ashram’s cows, wearing garlands of yellow flowers, and with their bodies decorated with vibhuti and kumkum, were led out from their shed. The cows were led out to the to the steps of the main temple, accompanied by a procession singing Krishna bhajans. Immediately, those around began to lovingly pet and caress them, speaking soft words of gratitude and offering various forms of praise, such as bowing their heads with folded hands and chanting scriptural verses. This is a moment to personally thank the cow for all that she selflessly gives us, honouring her as our mother. People will hand-feed the cows, one by one, with a small bunch of plantains. It was very touching to see the sincerity in their reverence for the gentle creatures taking food from their hands. And the cows seemed to return the sentiment by sincerely revering the plantains! There they were honoured once again by more bhajans, and showered with flower petals and holy water. Ashram pujaris waved incense and an arati lamp, and applied sandal paste and kumkum to their foreheads, accompanied by scriptural chants. Finally, the cows were each once again showered with flower petals, and fed more plantains. Although brief and simple this beautiful ceremony reminds us that we derive all sustenance from our Mother, in whatever form She comes, whether as our birth mother, our cow-mother, or our Divine Mother.